The table top is back, cut to final length, and sanded (sorry, no chance to take photos of my friend’s amazing shop). 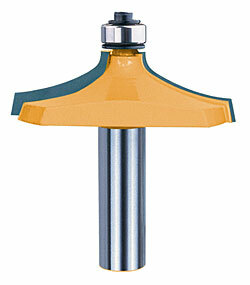 To use such a large-diameter bit one must reduce the router speed to around 10,000-12,000 RPM. In addition, I suggest shallow cuts. I took four passes to route the entire profile. Now the table is ready for the first coast of Zinsser’s Seal Coat. I will apply using a lint-free rag. This results in application of a very thin film of shellac on the oak. White oak, and especially red oak, have high tannin content. White oak may or may not be marginal. This high tannin content makes them acidic. The typical waterborne coatings are very high pH, typically pH 10 or higher. Applying the typical waterborne coating directly on the surface of the oak can cause nasty reactions. For example, it is possible to get bridging and pinholing. Therefore, a work-around is needed. Enter: Zinsser’s Seal Coat dewaxed shellac. I apply two very thin coats using a lint-free cloth. I allow it to fry for two hours, sand between coats to 320 grit, and then apply the waterborne coating. For this table I will use Target Coatings’ new Emtech 2000wvx alkyd. My client liked the finish on the half-scale tables. As a result, I will use the same finish, and apply 4 coats minimum , using a Fuji Q3 Pro HVLP system. The EM200wvx imparts a very nice straw color to the white oak. And it looks great on walnut (the legs of this table). What is coming up next: Milling the walnut stock for the legs, and the quarter-sawn white oak stock for the aprons. Then, fun with the FMT to cut mortises and tenons. And to cut the tenons on the long aprons I will have to use my special, secret weapon – the special base, propped up on the workbench.